Click on map or photo to see larger version. Sanak Island is generally low in elevation with many lakes, streams and swamp areas. The highest point on the island is Sanak Peak at 1,740 feet. The island is surrounded by many reefs and a number of small islands. 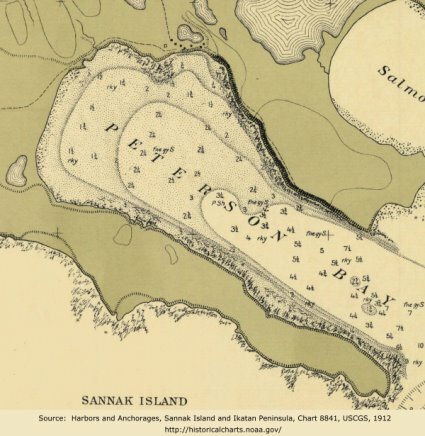 Sanak Island lies southeast of Unimak Island. 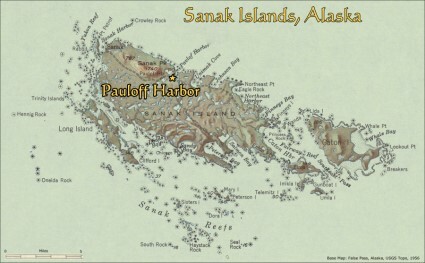 The fishing banks around Sanak are considered to be some of the richest in Alaska. Sanak was the center of sea otter hunting until otters were locally wiped out by over exploitation. Later, it became the center for codfishing until the cod petered out. Without employment, the villages failed. 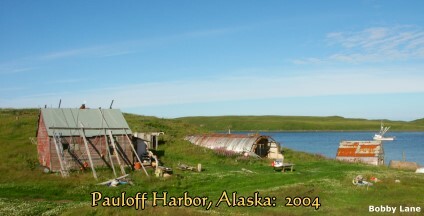 An Aleut village in Pavlof Harbor may have existed at the head of the bay, and Lydia Black thinks that this may have been a village called Kasiq.2 There are traces of what appear to be Aleut barabara house pits in the photograph above, taken in 2006. The traces near the head of the bay on the small peninsula next to a lagoon, are fairly typical of locations favored by Aleuts for their barabaras, but only archeological studies will answer the question. When the codfish station was built, the requirement was for a protected place to anchor sailing vessels and to build a dock for unloading cod from the fishing dories. 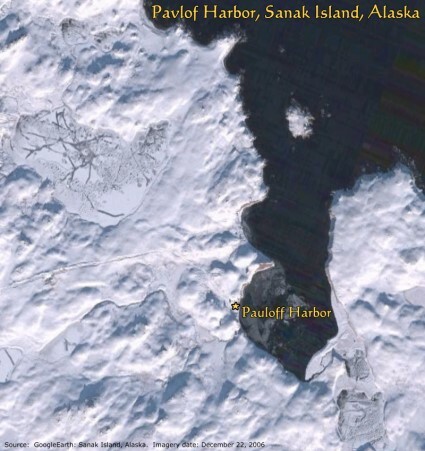 So, deep water next to shore was needed and a location on the west side of the bay was selected, which is the location of the community of Pauloff Harbor. Several building are still standing and they can be seen in this photograph. 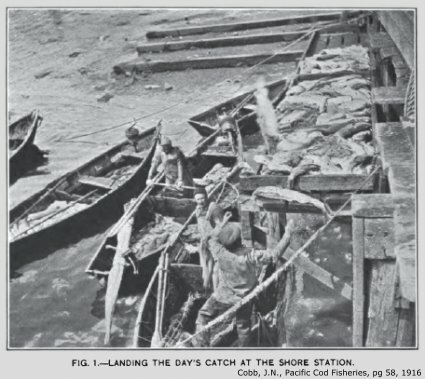 Since the Pauloff Harbor codfish station was established fairly early, some of the Aleut fishermen who fished for the company, may have built modified barabaras that have left their traces. 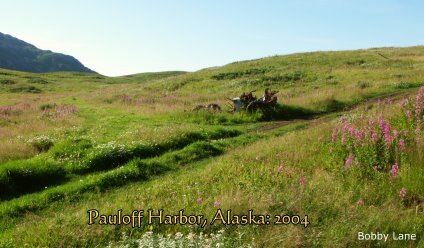 The large number of house pits along the road near the town center are a mystery since they do not resemble typical Aleut village patterns. This question and other settlement pattern questions will hopefully be resolved by talking with people who used to live in Pauloff Harbor. The history of Pauloff Harbor is linked to the creation of the Union Fish Company and the building of a codfish station in Pavlof Harbor in 1886. "The late Thomas W. McCollam, of the McCollam Fishing and Trading Co., of San Francisco, was the first to perceive the advantages to be obtained from establishing stations close to the cod banks, where the fishermen could go out daily in dories to the adjacent banks and the catch could be stored ashore until a cargo accumulated, when a vessel could be sent north to bring them to San Francisco." "Early in the seventies a party of hunters had established a station at Pirate Cove... at the north end of Popof Island, one of the Shumagin Group..... Mr. McCollam purchased this station and established here the first regular shore fishing station for cod in Alaska." "In 1886 a branch fishing station was established on Pavlof Harbor, Sannak Island. In 1890 a station was opened at Kasatska, on the south side of Sannak Island, and was operated for several years, finally being abandoned because of the dangerous navigation for sailing vessels on the shore. The Port Stanley, Sannak Island, station was established in 1891, but was abandoned a few years later. All of these were what are known as "winter stations", that is, stations operated in what are known as the winter months in Alaska; during the rest of the year the fish are too far out in the deep water for fishing with dories with the shore as the base." The methods for catching and processing cod and the fishing and transporting vessels for the industry were brought to San Francisco from the east coast of the U.S. where there was a long tradition of cod fishing. 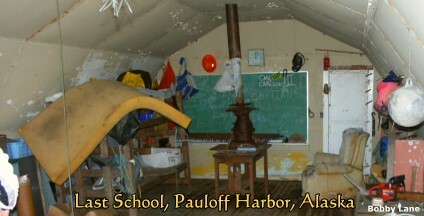 The first fishermen to work at the Pauloff Harbor codfish station were mostly from Scandinavia where codfishing was well known. These fishermen brought their fishing knowledge and skills with them and many of them settled here to raise families. This influx of northern European immigrants had a lasting influence on the unique social and cultural character of Pauloff Harbor and the surrounding communities. A detailed description of how cod was caught and processed in the early days can be seen here. 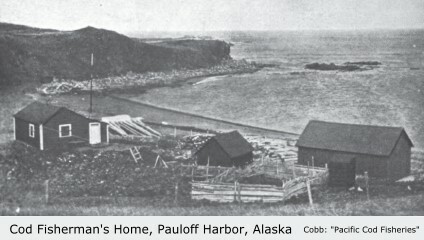 A 1913 picture of the Union Fish Co. codfish station at Pavlof Bay can be seen here. 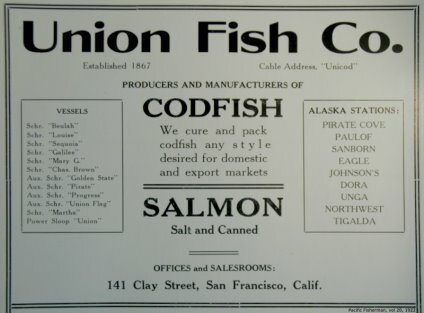 The Union Fish Company had its headquarters and cod processing plant in San Francisco. 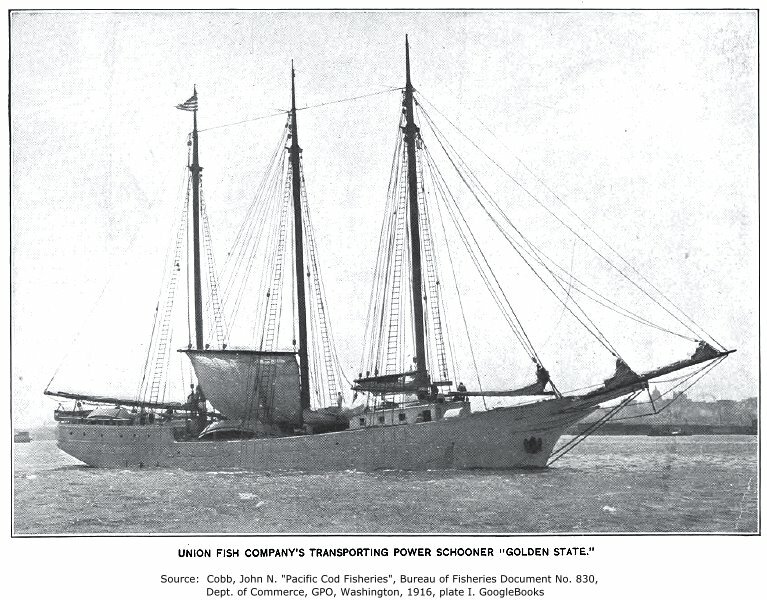 The company maintained several transporter sailing and powered ships that carried the cod produced at Pauloff Harbor and other Alaskan stations to San Francisco for processing. These ships also carried men and supplies to the Alaska cod stations. 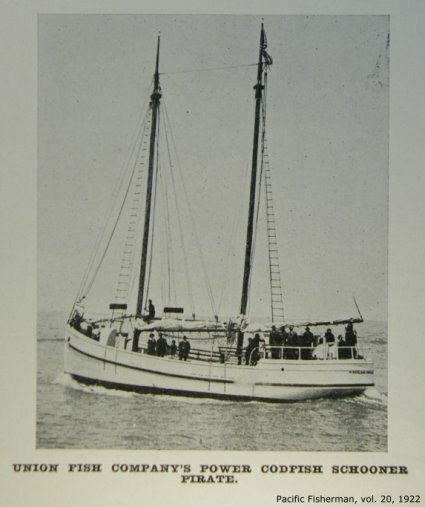 The most famous of these ships was the S/V Golden State, seen below. 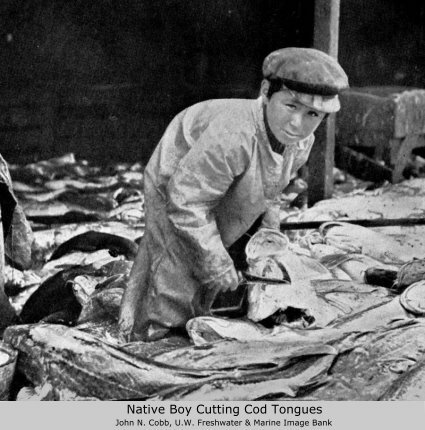 San Francisco was the headquarters of the land-based cod industry in Alaska and you can read about it's history here. The Union Fish Company is still in existence and maintains a website with an interesting history of the company here. 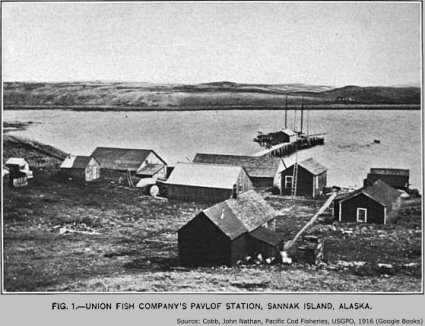 The other functioning cod station on Sanak Island was located at Sanak village/Company Harbor and was owned by the Alaska Codfish Company, also headquartered in San Francisco. Union Fish Co. also established a codfish station at Johnson Harbor, two bays to the east of Pauloff Harbor. This station was operational in 1908 through 1915.1 It was closed shortly after that and nothing remains of the station today. 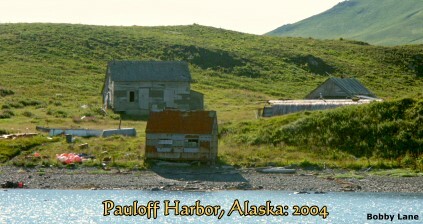 Pauloff Harbor is now abandoned. The photos below show the location of the original codfish station. The photo below to the left, is looking northward with the entrance to the harbor on the right. 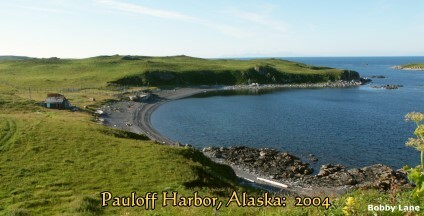 Pauloff Harbor was founded on Pavlof Harbor primarily because it afforded good anchorage and protection for the codfishing fleet. The productive fishing banks around Sanak Island provided an economically stable basis for the community for about fifty years. This was a community of fishermen and when the codfish petered out in the late 1930's and the codfish station closed, the local fishermen switched to fishing for salmon. Being resourceful fishermen, they built boats and entered the salmon fishery centered around the salmon cannery at False Pass, on neighboring Unimak Island. Salmon fishing was relatively stable also, yet little by little, people began to follow their relatives and emigrated to other towns in the area, mostly Sand Point. The last census was in 1970 and the last people left soon thereafter. 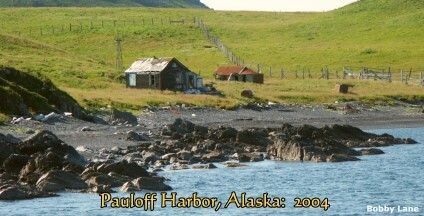 The Pavlof Harbor codfish station in 1900 showed a typical enclave type of business where all the workers were brought in from the outside and there were no local Aleuts. The Union Fish Company built this station to harvest the rich codfish banks surrounding the Sanak Islands. 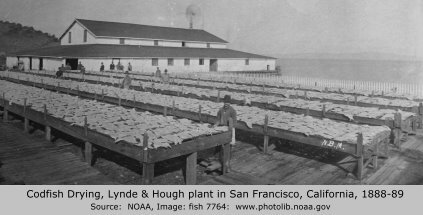 The salted codfish product was shipped to San Francisco for further processing. The company had to construct the entire station as there was nothing at this location previously. 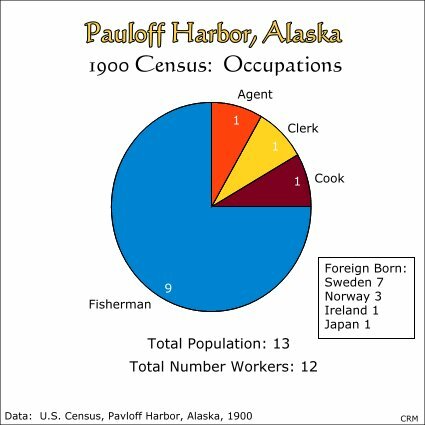 The census shows that the clerk and his wife were born in the U.S., but the agent was Norwegian, the cook, Japanese, and all the fishermen were foreign born, mostly from Scandinavia. 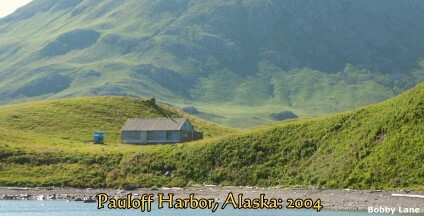 At this time Pauloff Harbor might not yet be called a community as there was no school, no post office, no children and no people from the surrounding Aleut communities. 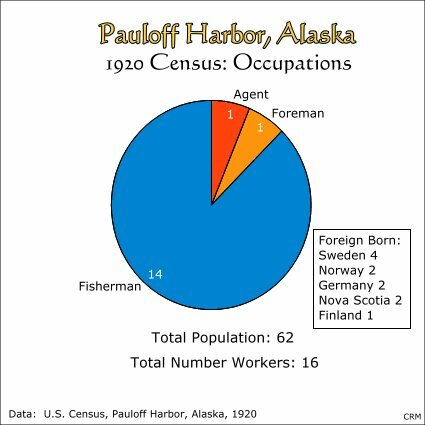 The 1910 Pauloff Harbor census shows that the community was undergoing some basic demographic changes. Now, there were a number of families. 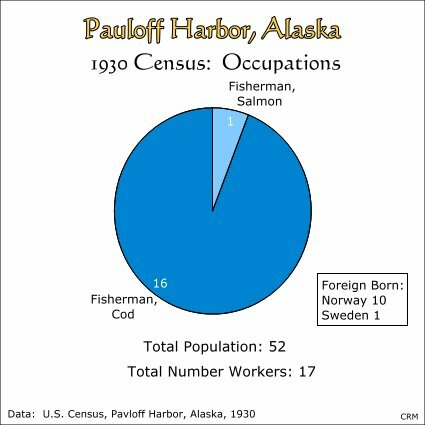 All the foreign-born men had married local Aleut women and they had fairly large families. Out of the total population of 25, 17 were now considered Aleuts. The man that was born at sea was also a trapper and hunter. One Aleut man was also a hunter/trapper. 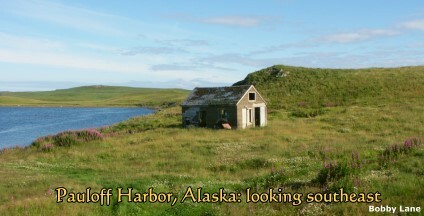 They probably trapped foxes on Sanak Island, but perhaps they also ventured over to Unimak Island and the Alaska Peninsula to seek out more furs. The census does not indicate that an agent of the Union Fish Company was here at this time. Perhaps one of the single men described as "head" was the representative of the company. 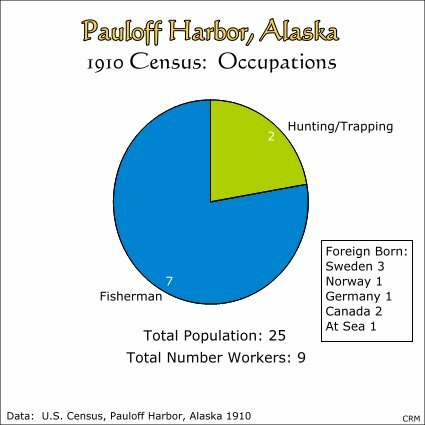 The Pauloff Harbor census of 1920 shows that the population had more than doubled since 1910 for a total of 62 inhabitants. The number of fishermen also doubled in that time period, so the cod business was apparently doing well. At this time, there were two workers for Union Fish Co., the agent and an assistant. The number of foreign born men also increased from 8 to 11. Many of these men would marry Aleut women and have children and remain in the area. At this time it appears that the economic benefits of codfishing out-weighed that benefits of trapping since there are no trappers listed in the census. For a story about codfishing in 1927, click here. 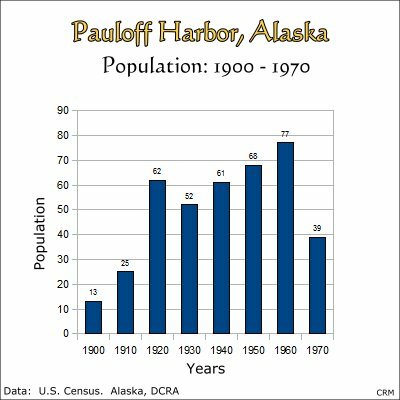 The 1930 Pauloff Harbor census shows that the population had dropped by 10. The census indicates that there were 10 men from Norway and one from Sweden at this time. At this point, all the occupations in the community were described as fishing. For the first time, one fishermen says that he depends for his livelihood upon fishing for salmon rather than cod. This fishermen's name was John Olsen and in 1932 he put up 52 barrels of salted salmon.7 The source of local red (sockeye) salmon on Sanak Island is on the southern end of the island at Salmon Bay and he most likely had a fish camp there or nearby. 1930 is that last census where detailed occupation information is available. But, since cod were disappearing in the area, it is known that the fishermen switched to fishing for salmon and they delivered their fish at False Pass. Below, one can see several "Sanak boats" at the Coal Slip in False Pass in about 1963. 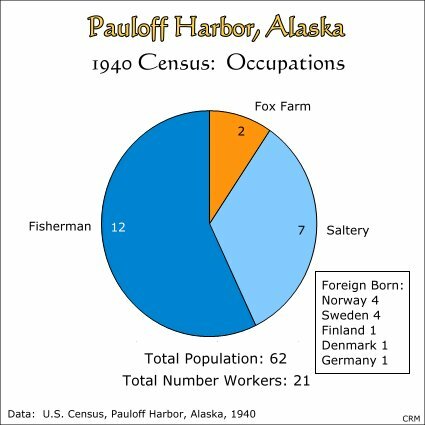 The 1940 census for Pauloff Harbor shows a increase in population of 10 people over 1930. 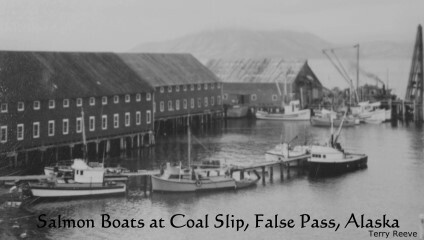 The sheltered harbor in Pauloff Harbor facilitated the keeping of salmon fishing boats and there were 12 men involved in the fishery for delivery of fish to the cannery in False Pass. The salt salmon business was also lucrative at this time and 7 men were involved in salting salmon to be shipped to Seattle for sale. Many of these salt salmon were caught near the stream that empties the lake at the south end of the island at Salmon Bay. Two men ran fox farms which were most likely on small islands near the main island of Sanak. The count of foreign born males is the same as 1930 and probably reflects a more accurate identification of their nationality by the census taker. 7) Pacific Fisherman, Statistical Yearbook, vol. 31, 1933.